Doming creates a 3D decoration, achieved by applying a resin layer over the printed image. Applicable for: Plastic (PS, PP, PE, PP, ABS, AS), paper, wood, metal, aluminium, brass, stainless steel, nickel, chrome, natural and imitation leather. Embroidery is a decorating process for fabrics by which a thread is stitched in a pattern. Applicable for cotton, nylon, polyester, fleece materials. Engraving is a technique where the top of the product's coating is removed with a laser, revealing the undercoat. Applicable for: Metals, glass, ceramic, wood, paper, jeans, acrylic glass. Products for decoration: Pens, key chains, usb's, mugs, speakers, stress relievers. An image is heat pressed onto the surface with a die, creating a depressed area. Colored foil (for hot stamping) or technical foil (for debasing) is placed above the material and decorating begins. Hotstamping is not available for wearables. Products for decoration: Notebooks, wallets, portfolios, wearables. The image is printed with sublimation ink on sublimation paper. Heat presses are then used to apply the decoration from the paper onto the item. Under pressure and high temperature the ink turns into a gas form and creates an imprint that can't be felt by touching. 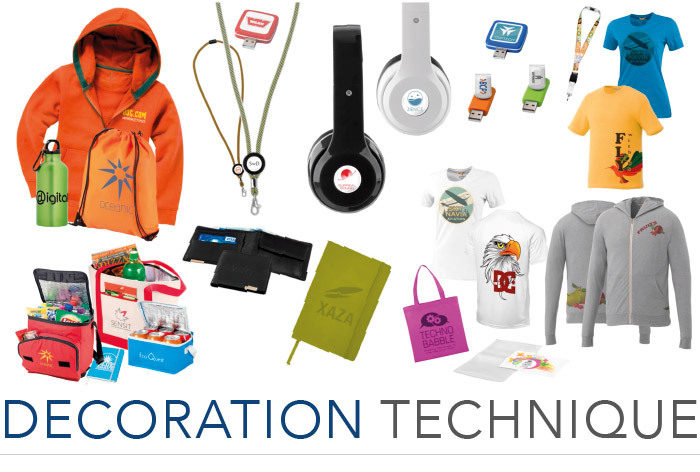 Products for sublimation: Mugs, aprons, lanyards, bags and totes, umbrellas, caps. Pad printing or tampon printing is an indirect offset printing process that can transfer a 2D logo onto a 3D object. The ink is transferred from the printing plate, which is called a cliché, via a silicon pad onto the product's surface. Applicable for: Plastic, glass, ceramics, wood, paper, artificial (PVC and PU) and natural leather, metal, aluminium, brass, stainless steel, nickel, chrome, soft-touch, gloss surface. Screenprinting is a printing technique that uses a woven mesh and a squeegee to impress the ink through a mesh onto the product. Products for Screenprint: Textiles, bags, totes, umbrellas. Products for Screenround: Pens, lipbalms, mugs, flasks. Transfer print is a printing technique that uses a hot-press to transfer an image from a special paper onto the product. Products for decoration: Bags, totes, umbrellas, textiles, caps, safety vest, portfolios. Give your brand new dimensions. Create multiple thicknesses on multiple surfaces. Standard or metallic. Products for decoration: Bags, Totes, Umbrellas, Fabrics, Caps, Wallets.